This document will guide you through the installation of the Tailspin Surveys application for Microsoft® Enterprise Library 5.0 Integration Pack for Microsoft Azure, including the Autoscaling Application Block ("WASABi") and the Transient Fault Handing Application Block ("Topaz"). The Surveys application is a comprehensive sample application that demonstrates how you can use the Autoscaling Application Block to scale an application running on Microsoft Azure™ technology platform up or down elastically, based on the rules you specify. In addition, it contains an example of a management site that you can use to configure service information and rules that are used by the Autoscaling Application Block to monitor how the application's role instances change based on the rules and the conditions causing the changes. The Tailspin Surveys application covers a few scenarios and features, but it does not cover the many other useful features of the Autoscaling Application Block or the Transient Fault Handing Application Block or the many possible scenarios in which you will benefit from their use. Therefore, we strongly encourage you to go beyond the basic uses of the application blocks demonstrated in the Tailspin Surveys application. For comprehensive coverage of the application blocks, see The Autoscaling Application Block and The Transient Fault Handling Application Block. This version of the Tailspin Surveys application builds on the previous releases of the Surveys application by Microsoft patterns & practices. Please refer to the installation documents of the previous releases for the topics that are not covered in this document. 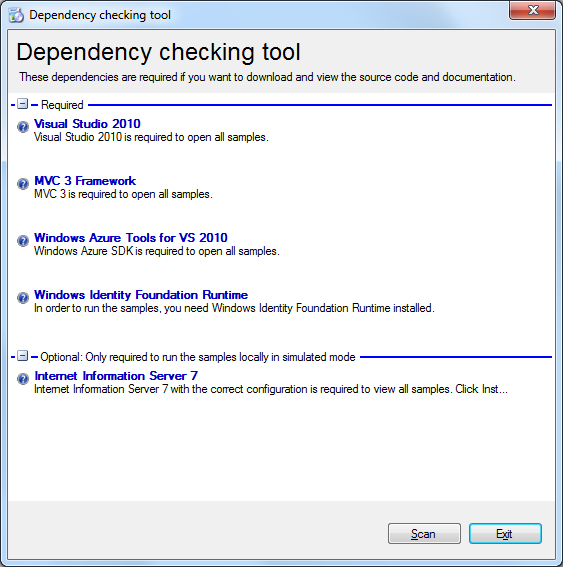 Installing the required dependencies using the included Dependency checking tool. Creating two hosted services for the Tailspin Surveys web application and the Tailspin Surveys autoscaling runtime and management application. Updating the project files with your Azure subscription information. Deploying the application to Azure. Verifying the installation on Azure. A development machine running Microsoft Visual Studio® 2010 development system SP1. All required Microsoft Windows® updates. A Azure subscription with room for two hosted services (if you want to run the Tailspin Surveys application and the Autoscaler component with the Management Web application in Azure). The Dependency checking tool, discussed below, which will verify that you have the prerequisites listed below installed. If not, it will help you install them. This is required to run the management site in simulated mode or to deploy the Autoscaler locally. The Dependency checking tool will check to see if you have the required prerequisites and, if not, will help you install them. Unzip the source code to a location on your hard drive. You should not place the source code in a folder that is nested too deeply, because the Azure Tools for Visual Studio do not support paths that are longer than 255 characters. We have tested the Tailspin Surveys application deployment from C:\Tailspin. Run "CheckDependencies.cmd" located in the root of your download folder. In the Dependency checking tool, click the Scan button. Ensure that all the required dependencies have been installed. If not, install each prerequisite one at a time and click the Rescan button. Generate the Azure management certificate and export it. Create the required hosted services. Upload the certificates as hosted services' service certificates. The sections below will walk you through each of these tasks. Export from Current User\My store to upload to the Azure Management Portal. 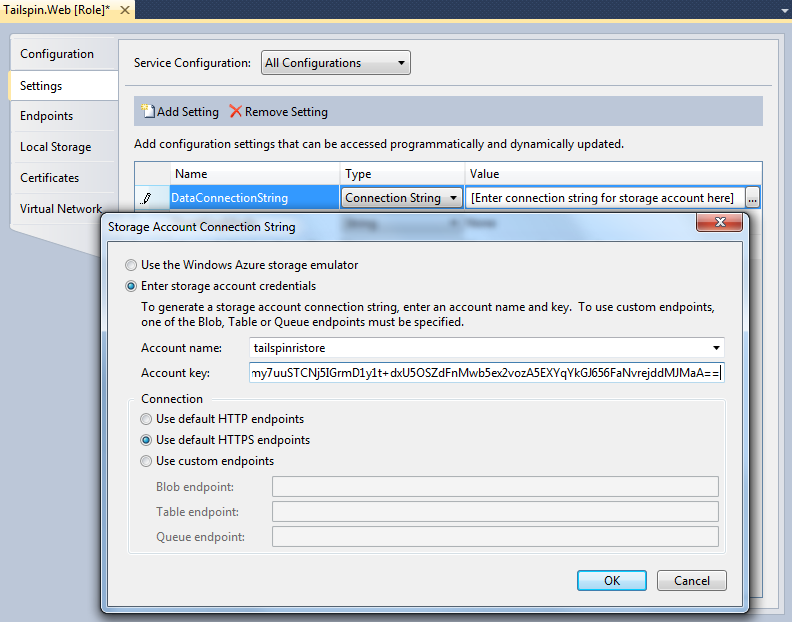 Generate the SSL certificate to upload to the Azure Management Portal. Azure roles that expose SSL endpoints or affect changes to Azure deployments, such as the Autoscaling Block, require access to the related certificates from within the running instances of those roles. These certificates need to be uploaded to the Service Certificates section of the corresponding hosted services. The certificates created by the sample application for SSL use are for demonstration purposes only and are not meant to be used in production. The management and SSL certificates .pfx files generated during installation should be kept in a safe location with strict permissions via access control lists (ACLs), or deleted after uploading them to Azure. Go to the Azure profile generation site at http://go.microsoft.com/fwlink/?LinkId=229563. Sign in to your Windows Live® account that has a Azure subscription. Start Visual Studio as an administrator. To do this, right-click on Microsoft Visual Studio 2010 and select Run as administrator. Right-click on the Tailspin.Surveys.Cloud project and click Publish. Note that you will not complete the wizard yet; you will only perform some steps to generate and import the management certificate in preparation for the deployment. 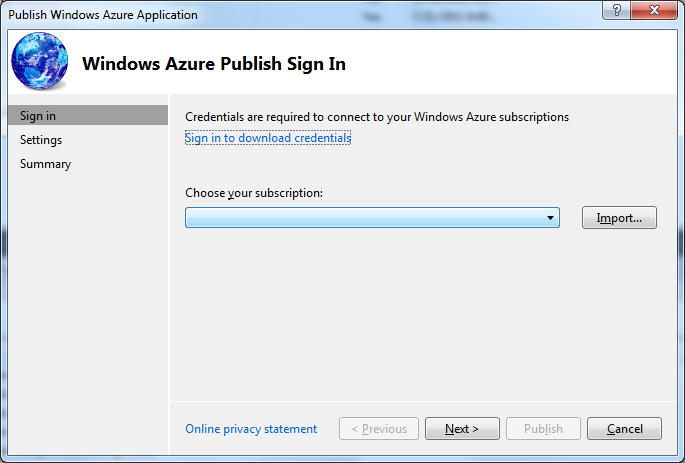 In the Publish Azure Application wizard page, click on the "Sign in to download credentials" link. The link will open the Internet browser and navigate to the Azure site. Sign in with a Windows Live account with a Azure subscription. Follow the steps on the page to download the .publishsettings file. 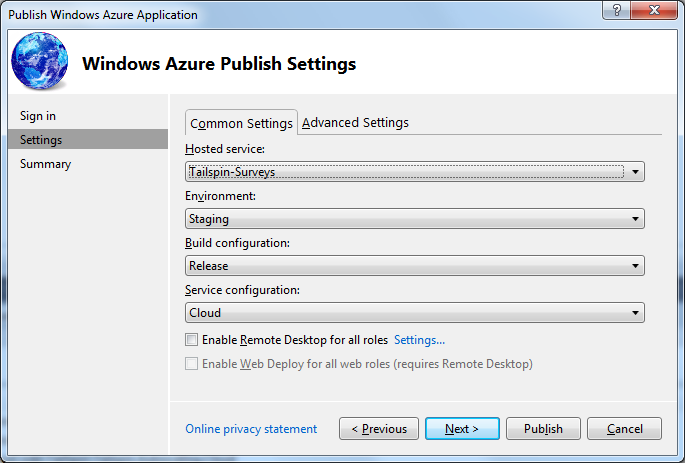 Return to the Publish Azure Application wizard page in Visual Studio. Click on the Import button and browse to the .publishsettings file you have just downloaded. You can now click Cancel because you will need to prepare the solution before you can publish to Azure. After this step, Visual Studio will be configured to publish to your Azure subscription, and the management certificate will be installed in the Current User\My certificate store. Start the Microsoft Management Console (MMC). Select File, select Add/Remove Snap-in. 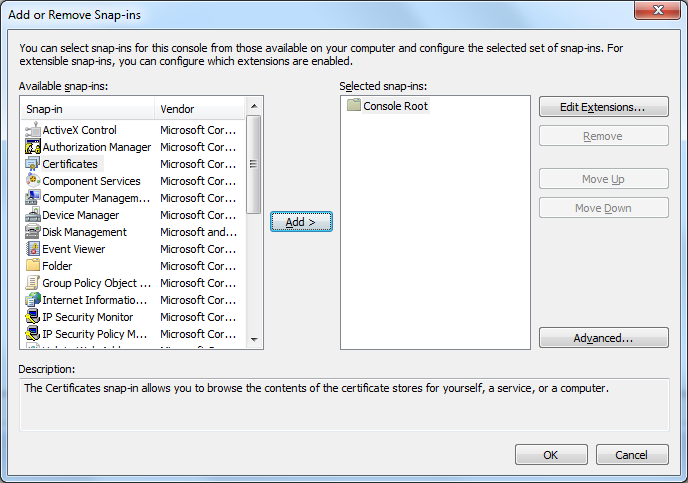 In the Add or Remove Snap-ins dialog, from the Available snap-ins, select Certificates, and click Add. In the Certificates snap-in dialog, select My user account. Click Finish. In the Add or Remove Snap-ins dialog, click OK. In the MMC Console, select Certificates - Current User. Expand Personal, and select Certificates. In the Microsoft Management Console certificates list, locate and right-click the Azure Tools certificate that you imported in the previous steps, select All Tasks, and click Export. Click Yes, export the private key. Click Next. Keep the Personal Information Exchange –PKCS #12 (.PFX) as the default. Click Next. Enter a password for the exported file. Do not use a blank password because a password is mandatory when uploading a .pfx file to Azure. Enter the directory where the application is located and give it a name such as "C:\Tailspin\AzureManagementCert.pfx" and click Next. Open a Visual Studio Command Prompt (2010) as an administrator (in the Windows 7 Start menu, type Visual Studio Command Prompt, select the "Visual Studio Command Prompt (2010)", right-click and select Run as administrator). Change directories to the folder where you unzipped the source code for the Tailspin Surveys application. To generate the SSL certificate, enter "GenerateSSLCert.cmd." 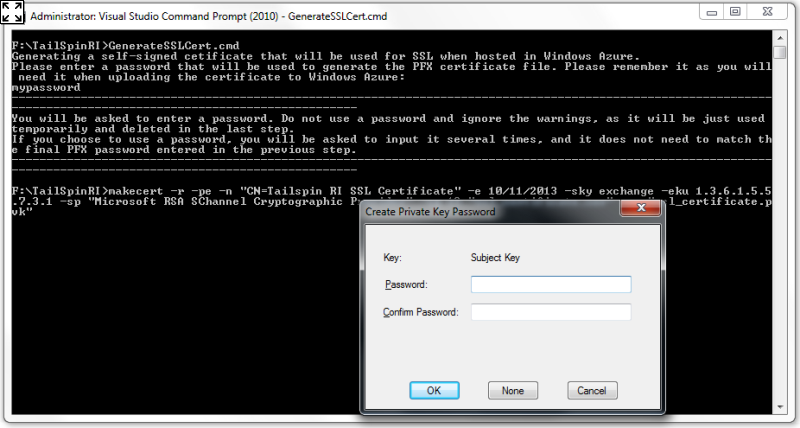 Enter a private key password for the certificate file. This is mandatory. A window will pop up asking you to provide another password. Keep this blank and click OK.
You will see a popup to confirm the creation of the certificate without password protection. Click Yes, because this latter password would only be used temporarily, but the generated .pfx file will use the password you entered in the previous step. After completing these steps, you will have the SSL certificate in a file named ssl_certificate.pfx in your current directory. Next, you will need to create the hosted services. 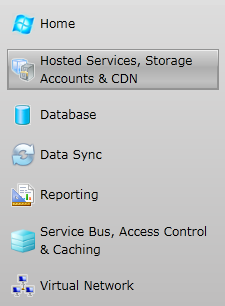 In the Management Portal - Azure, click Hosted Services, Storage Accounts & CDN on the navigation bar on the left. Click Hosted Services on the left menu. Select New Hosted Service, either from the ribbon bar or on the context menu, by right-clicking on your Azure subscription. In the "Enter a name for your service" text box, enter Tailspin-Surveys. In the "Enter a URL prefix for your service" text box, enter a name of your choice to signify that this is the Tailspin web application. This prefix must be unique. Select Create a new affinity group from the "Create or choose an affinity group" drop-down menu. In the Create a New Affinity Group dialog, enter an Affinity group name and select a Location, and press OK. Select the Azure subscription to create the second hosted service. In the "Enter a name for your service" text box, enter Tailspin-Autoscaling. In the "Enter a URL prefix for your service" text box, enter a name of your choice to signify that this is the Tailspin Autoscaling management website and run-time worker role. This prefix must be unique. Select the Affinity group that you created in the previous step from the "Create or choose an affinity group" drop-down menu. You should see the two hosted services. The cloud projects you will deploy to Azure use the service certificates that must be uploaded to the Azure service management certificates store. They are the secure sockets layer (SSL) certificates the websites use and the Azure management certificate the Autoscaling Application Block uses to govern the number of instances of configured roles. Add the SSL certificate to the Tailspin-Surveys hosted service. In the Management Portal - Azure, select the Certificates folder under the Tailspin-Surveys hosted service and click Add Certificate. In the Upload an X.509 Certificate dialog, browse to the ssl_certificate.pfx certificate that was generated previously. Enter the password. Click OK.
You should see the Tailspin RI SSL Certificate certificate added to the service certificates list on the portal. Add the SSL certificate to the Tailspin-Autoscaling hosted service. In the Management Portal - Azure, select the Certificates folder under the Tailspin-Autoscaling hosted service and click Add Certificate. 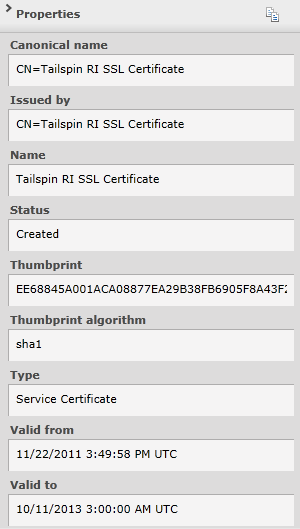 You should see the Tailspin RI SSL Certificate added to the service certificates list on the portal. Add the management certificate for the Tailspin-Autoscaling hosted service. In the Upload an X.509 Certificate dialog, browse to the AzureManagementCert.pfx certificate that you exported previously. You should see the Azure Tools certificate****added to the service certificates list on the portal. You should see the hosted services with the certificates, as shown in the following image. The Autoscaling Application Block uses Azure storage for its operations. For more information about autoscaling and how the Autoscaling Application Block works, see Chapter 4, "Autoscaling and Microsoft Azure," in this guide. In this step you will create the storage account that the Autoscaling Application Block will use in the Tailspin scenario. In the Management Portal - Azure, select Storage Accounts. Select the correct subscription, right-click, and select New Storage Account. Choose a region or affinity group you created previously. You should see the added storage account. You should make note of the name of the storage account because you will need it to configure your Visual Studio solution. In Visual Studio, for each of the cloud projects' roles, double-click the role, and click on the Configuration tab. Clear the check box "Use publish storage account as connection string when you publish to Azure" if it is checked (it should not be checked). Modify the certificates in the Visual Studio Cloud Projects. Prepare the settings in the Cloud Projects. The Tailspin Surveys application depends on certain binaries that are not included in the .zip file. Perform the following steps to download and install these dependencies using the NuGet Package Manager. In Solution Explorer, right-click the Tailspin solution, select Enable NuGet Package Restore, and click Yes in the confirmation dialog box. The Cloud projects in the Tailspin scenario use various certificates you have uploaded to Azure in the previous sections. In this step, you will modify the Cloud projects to correctly refer to those certificates for the roles. 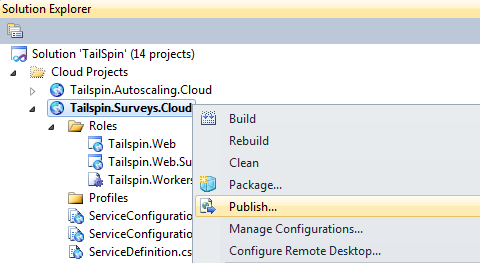 In Visual Studio, in the Solution Explorer, select the Tailspin.Web role under the Tailspin.Surveys.Cloud project. Double-click the Tailspin.Web role and click Certificates. You should make the thumbprint for ssl_certificate match the thumbprint for Tailspin RI SSL Certificate in the Management Portal - Azure. Update the thumbprint in Visual Studio, copying the value from the portal. Also make sure the Store Location is set to LocalMachine, and Store Name is set to My. Double-click the Tailspin.Web.Management role under the Tailspin.Autoscaling.Cloud project, select Certificates, and ensure that the thumbprint for the ssl_certificate corresponds to the thumbprint for the Tailspin RI SSL Certificate in the Management Portal - Azure. Double-click the Tailspin.Workers.Autoscaling role under the Tailspin.Autoscaling.Cloud project, select Certificates, and ensure that the thumbprint for the TailspinManagementCert corresponds to the thumbprint for the Azure Tools certificate in the Management Portal - Azure. In this step, you will need to update the settings in the Cloud projects to specify the storage account you created previously. Select the storage account that you created previously. On the right-hand side, under Primary access key, click View. In the View Storage Access Keys, copy the Primary access key. In Visual Studio, double-click the Tailspin.Web role in the Tailspin.Surveys.Cloud project and click Settings. In the Service Configuration drop-down, select All Configurations. Ensure that the setting type for DataConnectionString is Connection String. Click the ellipsis (…) button to the right of the DataConnectionStringValue field. In the Storage Account Connection String dialog, select Enter storage account credentials. Update the Account name with the corresponding name of the storage account that you created previously. Update the Account key with the primary access key copied in step 2. You will need to update the connection string value in several settings. Instead of using the Storage Account Connection String dialog every time, you can copy the value of the connection string you created in the previous step, and paste it into the Value field for the remaining settings. In Visual Studio, double-click the Tailspin.Web.Management role in the Tailspin.Autoscaling.Cloud project and click Settings. Set a username and a password in the provided settings. Setting a password is mandatory for security reasons. At this point, you are now ready to build the Tailspin solution. In the Visual Studio Solution Explorer, select the Tailspin solution in Visual Studio. Right-click and select Rebuild Solution. Once you've deployed one project, you can deploy the next one as soon as you see that the deployment was added and has started in the Visual Studio Azure Activity Log window. System.Security.VerificationException: Operation could destabilize the runtime. Workaround: To address this issue, you will need to disable IntelliTrace on the Autoscaling Application Block assembly. To do this, add Microsoft.Practices.EnterpriseLibrary.WindowsAzure. * to the list of excluded modules. See instructions here: VerificationException from Azure IntelliTrace. You will first deploy these projects to the Staging deployment slot in your hosted service because the default values in the service information store for Tailspin Surveys reference the deployment in the Staging slot. In Solution Explorer, right-click the TailSpin.Surveys.Cloud project and select Publish. In the Azure Publish Sign In step, select the subscription you imported in the previous steps, and click Next. 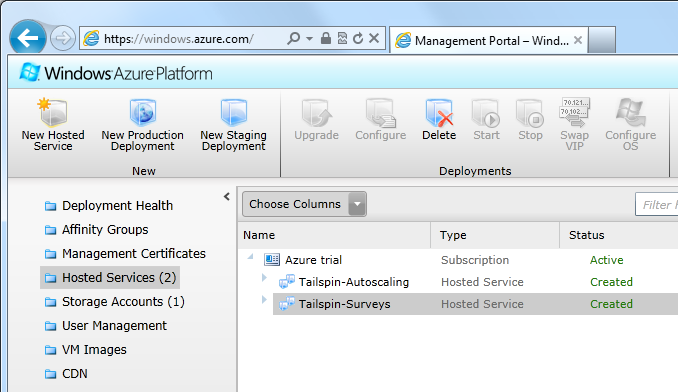 In the Azure Publish Settings step, select Tailspin-Surveys as the Hosted service. Select Staging as the Environment. In the Service configuration, select Cloud. Click Publish to publish the hosted service. Before continuing with the next step, wait until the project finishes building and you see that the deployment was added and has started in the Visual Studio Azure Activity Log window. In Solution Explorer, right-click the Tailspin.Autoscaling.Cloud project and select Publish. 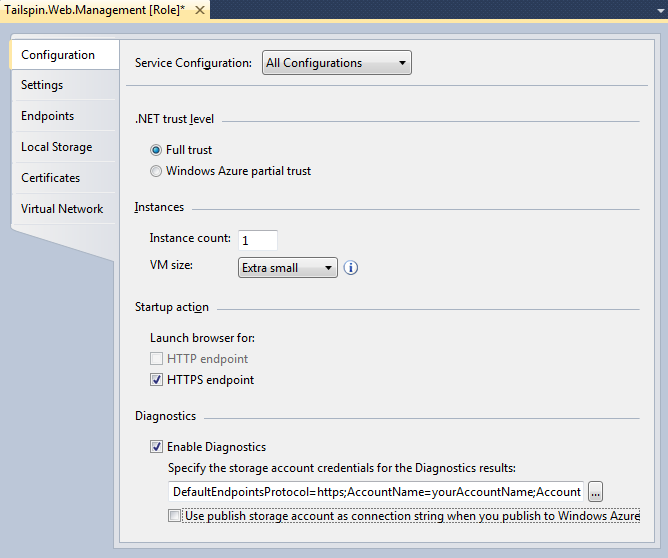 In the Azure Publish Settings step, select Tailspin-Autoscaling as the Hosted service. You should ensure that the Tailspin Surveys application works from a public website, tenant website, and management website. Tailspin contains a public website that allows end users to fill out surveys. To view this site, browse to the hosted service for Tailspin-Surveys. You can find this URL in the Management Portal - Azure. Go into the Hosted Services section and select the Tailspin.Surveys.Cloud deployment that is under the Tailspin-Surveys hosted service. You will see the DNS name on the details on the right, and you can right-click and copy this value. Tenants can access the tenant website. This website allows the tenants to create surveys and analyze the results. There are two tenants provisioned: Adatum and Fabrikam. To view this site, browse to the hosted service for Tailspin-Surveys using HTTPS. You can find this URL in the Management Portal - Azure. The URL is the same as the public website, but you need to change the scheme from HTTP to HTTPS. Because the solution uses a test certificate, you will see the message: "Continue to this website (not recommended)." Click on this link to continue. When you browse to this site, you will be logged on using (simulated) claims-based authentication. Tailspin operators can use the management website to manage rules and monitor the autoscaling process. There is also a page to generate a simulated load on the website, to show how the autoscaling process works. To view this site, browse to the hosted service for Tailspin-Autoscaling using HTTPS. You can find this URL in the Management Portal - Azure. Go into the Hosted Services section and select the Tailspin.Autoscaling.Cloud deployment that is under the Tailspin-Autoscaling hosted service. You will see the DNS name on the details on the right, and you can right-click and copy this value, but make sure to update the scheme to use HTTPS instead of HTTP. Now you are ready to configure the Service Information Store and upload the sample rules. The Service Information Store specifies the roles in the application that can be scaled, as well as additional settings for the operation of the Autoscaling Application Block. In order to see the scenario running, you will need to configure the Service Information Store to match your newly created environment. Navigate to the Tailspin management site. Click the Reset service model to default link under the Service Information XML file heading in the Rules and Service Information Stores section. This option is only available on the Home page, not on the Service Information tab on the Navigation tab. This will upload to Blob storage a copy of the default-service-information-set.xml file that is in the SourceCode\Tailspin\Sample stores folder in your installation location. The default service information file does not contain the correct subscription information, so click the Service Information tab on the navigation bar in order to update it to reflect your current deployment in Azure. Click the line on the Subscriptions list with the TailspinSubscription name. You will paste in the value from the next step here. 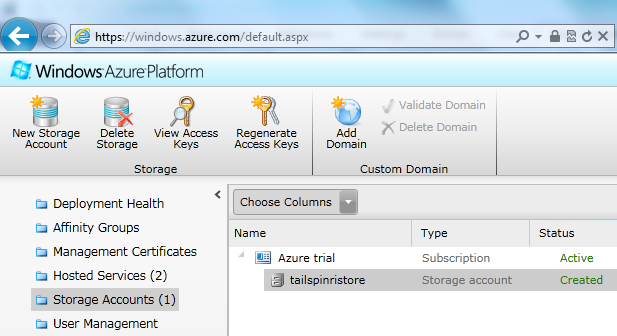 In the Management Portal - Azure, select your subscription. On the right-hand pane, select and copy your subscription ID using Ctrl+C (the portal is a Microsoft Silverlight® browser plug-in application, so the right-click copy menu option is not available). Paste the value into the SubscriptionId field on the Subscription Details form in the Tailspin management site. 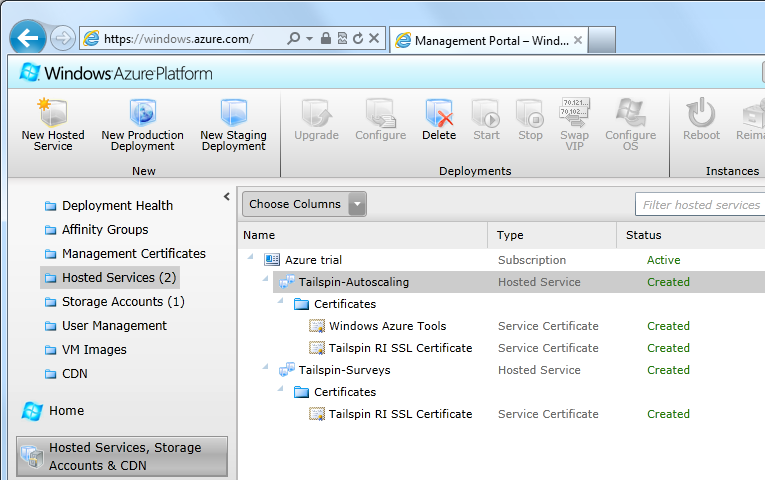 Select the uploaded Tailspin management certificate with the name Azure Tools. Select and copy the thumbprint of the certificate from the pane on the right-hand side. Paste the thumbprint value into the Management Certificate Thumbprint field on the Subscription Details form in the Tailspin management site. In the Management Portal - Azure, select Tailspin-Surveys Hosted Service. Select the DNS Prefix value of the Hosted Service on the right-hand pane and copy the value. Paste the value into the DNS Prefix field under the Deployed Hosted Services section in the Tailspin management site form. In Visual Studio, double-click on the Tailspin.Workers.Autoscaling role under the Tailspin.Management.Worker.Cloud project roles. Copy the value of the AutoscalingStorage setting. Paste the value into the Connection String field under the Storage Account section in the Tailspin management site form. On the Tailspin management site, click on the Home tab. Click the Reset rules to default link under the Rule Set XML file heading in the Rules and Service Information stores section. This option is only available on the Home page, not on the Service Information tab on the Navigation tab. This will upload to Blob Storage a copy of the default-rules-set.xml file that is in the SourceCode\Tailspin\Sample stores folder in your installation location. After these steps, the Tailspin Surveys application should be automatically scaled based on the rules. You can go to the Monitoring tab to see how the target application evolves with time, or go into the corresponding tabs and change the reactive and constraint rules at run time to see how it behaves with different settings. The Autoscaling Application Block uses the Azure Storage functionality added during the SDK 1.6 timeframe, which is currently not supported by the Storage Emulator. Therefore, the local debug runs still need to access the live Azure Storage account. This is why you needed to set all of the connection strings in the Prepare the Settings in the Cloud Projects section to target All Configurations. Also, the Azure Service Management API is not supported on the Compute Emulator, thus the Autoscaling Application Block can only target hosted services deployed to Azure. The Tailspin.Autoscaling.Cloud project can be run in debug mode locally, but it needs to use Azure Storage for storing the data points and the target application must be hosted in Azure. If you wish, you can run the management application in simulated mode. This allows you to explore the management application without having to deploy the full Tailspin Surveys application to Azure. This experimental mode is provided to present you with the option to concentrate on the Autoscaling Application Block's interactions, without including any Azure-related extra steps. The solution uses an in-session storage, which is not durable across different sessions or debugs runs. 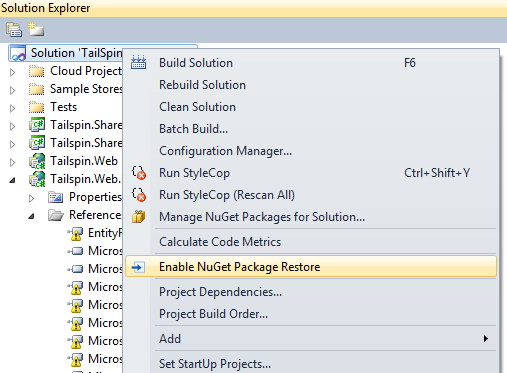 In Solution Explorer, right-click the Tailspin.Simulated solution, select Enable NuGet Package Restore, and click Yes in the confirmation dialog box. Set the Tailspin.Management.Simulated.Cloud project as the startup project. Because the solution uses a test certificate, you will see the following message in the browser window: "Continue to this website (not recommended)." Click on that link to continue. You should see the "Simulated Scaling Mode is currently active" message on the lower left corner of the browser window. If the rules and service information store XML files do not conform to the included schemas, the application throws an exception and stops working. Input field validation is currently incomplete. To learn more about this version of the Tailspin Surveys application, see the "Developer's Guide to the Enterprise Library 5.0 Integration Pack for Microsoft Azure."